Do students understand the real point of academic reading? Do students understand that the aim of instruction is transfer of learning? Am I using the right texts for making clear the value of strategies? Do students understand the difference between self-monitoring understanding and knowing what they might do when understanding does not occur? Am I attending to the fewest, most powerful comprehension strategies for academic literacy? Am I helping them build a flexible repertoire instead of teaching strategies in isolation? Do students have sufficient general understanding of the strategies (which is key to transfer)? Am I doing enough ongoing formal assessment of student comprehension, strategy use, and tolerance of ambiguity? In this post we consider question #2, on the goal of transfer. Students at all ages make this mistake, of assuming that their job is merely to give back what was taught the way it was taught. (This is of course not to blame students for this mess, since they can only have continued to believe this if teacher assessment were always making it true in practice). Transfer failure in tests. We have other, indirect, evidence of this phenomenon: the failure of students to transfer relevant prior learning in high-stakes tests, where presumably they would see the value of doing so as well as knowing how to do so. Here are two of my favorite highly-revealing test items about failure of transfer, with % of correct answers. A fellow fourth grader broke the news to me after she saw my effort on a class assignment involving scissors and construction paper. “You cut out a purple bluebird,” she said. There was no reproach in her voice, just a certain puzzlement. Her observation opened my eyes— not that my eyes particularly help—to the fact that I am colorblind. In the 36 years since, I’ve been trying to understand what that means. I’m still not sure I do…. Unlike left-handers, however, we seem disinclined to rally round our deviation from the norm. Thus there’s no ready source of information about how many presidents, or military heroes, or rock singers have been colorblind. Based on the law of averages, though, there must have been some. We are everywhere, trying to cope, trying to blend in. Usually we succeed. Until someone spots our purple bluebirds. Then the jig is up. 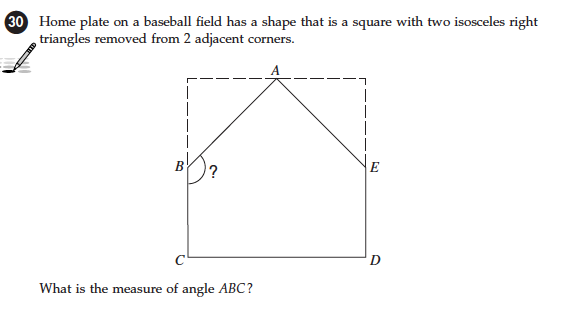 This was the hardest question on ANY 10th grade MCAS test, in 4 subjects, that year: only 33% got this one right. Only 27% got this one right – despite the fact that almost every student can recite the key theorems required here, if prompted to do so. Look closely at how the problem is set up to see the transfer expected – in multiple places – despite the easiness of the content (i.e. the Pythagorean Theorem and triangle and square angle sum theorems). However, declarative and procedural knowledge alone are not sufficient to ensure that children read strategically. They only emphasize the knowledge and skills required for performance and do not address the conditions under which one might wish to select or execute actions. Because strategic behavior involves intentionality and self-control, any analysis that ignores learners’ motivations is incomplete. We want to introduce a new term, conditional knowledge, to capture this dimension of learning to be strategic. Conditional knowledge includes knowing when and why to apply various actions. Building and updating Anchor Charts about what works, when, and why is then an easy and practical move, based on this research. Students must generalize from experience to make transfer more likely, along with understanding that such transfer is the goal. The reading performance goal has to be an utterly-clear constant priority – in this case, understanding of challenging non-fiction text. The goal is NOT skill or strategy mastery, but text understanding – and teachers must be confident that students grasp this aim: So, are we understanding this text better? If, not what might help us here? must be the recurring questions, leading toward self-questioning. The strategies must be taught and used simultaneously, not in isolation. It must be clear to students that, like hammers and screw-drivers, strategies are tools for building and improving (understandings, in this case). Thus, the development of conditional knowledge – considering which strategies work well, when, and why – has to become a priority, based on students analyzing what works and what doesn’t in attempts to understand. The strategies are most valuable when they are used as “self-testing mechanisms” in response to conscious self-assessment that something might not be understood (vs. taught as “skills” that may or may not be used or useful at this moment.) This relates closely to Question #3 of my Eight Implication Questions, concerning the choice of the right texts for use with strategies (to be discussed next time). The strategies must be used as comprehension problems dictate. As the authors elsewhere say, “Clarifying occurred only if misunderstandings were generated by some unclear aspect of the text or by a student’s interpretation of the content.” In other words, far more attention must be given to monitoring for understanding if the strategies are to take root. Meta-cognition of comprehension success and failure is key, more important than the comprehension strategies. Grant, I can endorse everything you say in your recommendations. The problem with strategies is that folks want to make a fetish out of them. They are just heuristics (which I like to call rules that don’t always work but will give you a leg up). The big thing to remember is that in 1983, we were trying to move from NO COMPREHENSION INSTRUCTION (it was all practice and assessment) to SOME. So we pushed hard on modeling and guidance as controlling metaphors. In my next post, we’ll look at Question #3, the issue of text choice when comprehension monitoring, strategies, and improvement of understanding are the clear goals. Sternberg & Frensch, “Mechanisms of Transfer” in Transfer on Trial: Intelligence, Cognition and Instruction, ed. by Detterman and Sternberg. Teaching for Transfer: Fostering Generalization in Learning, ed. by McKeough, Lupart & Marini. The Handbook on Research in Reading Comprehension, ed. by Israel & Duffy (2009) Routledge. I’ve been reading your series with great interest, Grant (especially having been mentioned in the first post), and think you’re dead on here. Too often we sacrifice meaning for skills and strategy instruction, rather than setting up students to be strategic, which in my book (and David Pearson’s it seems) means first helping students become more aware of what they don’t know and then giving them some time to try to figure out what they’re unsure of before stepping in to teach. To me that means thinking about reading as problem solving. And again and again, when I or teachers I work with do that, we see students automatically drawing on strategies without explicit instruction or directions to do so. They infer to figure something out, not because we taught them to in a lesson devoted to inferring. In fact, my very informal (i.e., formative) assessment of students is that many don’t really understand what inferring is, despite being taught it again and again. That abstract word for an abstract concept only becomes real for them when I can point out the exact places they did infer and why and how they did that. And without having experiences like that in a supportive setting—where, through their own agency, they see what inferring does for them as readers—it’s no wonder we don’t see more transfer to their independent work. I think you are dead-on about “inferring”. This has been a pet peeve of mine. You’ll be interested in the brand new post that I am putting up momentarily. (cf.Beers on inferencing needing to be taught not just assumed, in my earlier post). Looking forward to reading it. I’m aiming for one, myself on Sunday, where I’ll certainly be linking back to you. Great! Looking forward to it (Mine is now up). I cringe when I think about some of the assessments I used to give early in my career as a high school English teacher: a test at the end of a short story unit (Peter Smagorinsky, whom I read much later, argues that this is a questionable way of organizing a unit; coincidentally, it was from his book that I learned about the difference between declarative and procedural knowledge) in which I attempted to get students to analyze how authors used elements of fiction…in works we had already discussed in class, reading quizzes to ensure students were keeping up with the reading, a quiz after “covering” each act of Julius Caesar. I had thought that asking questions that were “higher up on Bloom’s Taxonomy” was sufficient to challenge students and deepen understanding. It wasn’t much later that I realized that what looked like a higher-order question (for example, “What is the significance of the carousel in The Catcher in the Rye?”) was effectively a lower-order question if it has already been asked and discussed in the context of the text being discussed. To put it another way, I realized that the Reading Standards are meant to be skills students should apply to ANY text, not THE text that happens to be the one the class is studying. I remember the first time I gave an assessment soon after this epiphany, a close reading “quiz” on a passage from Julius Caesar that I tried to backwards-design from the passage’s big ideas. I asked myself, “If a student really ‘got’ this passage, what would it look like?” When I announced the quiz, my students complained, “But we haven’t even discussed it yet!” I have not looked back since. David Pearson talks about the problem of making a fetish out of strategies. I think one of the barriers to creating the conditions for transfer is making a fetish out of the text, a manifestation of the sin of coverage that I was very much guilty of. From an English perspective, one of the teacher’s challenges is being able to distinguish between the transfer skill and the vehicle being used to teach that transfer skill. For English teachers, myself included, the gravitational pull of the vehicle can be very strong, so much so that it distorts the skill being taught. How to escape the pull? I think Kylene Beers and Robert Probst are on to something when they talk about “generalizable language” in the context of the gradual release of responsibility in their book Notice and Note. Have you read it? The problem, they write (I’m paraphrasing loosely here), is that when attempting to model the thought process of using that skill, teachers will often only talk about how the skill is applied to the work at hand. For example, they might say, “Notice how in this story, Sam has a frown, so I know he is sad.” The problem is that students might only be able to apply the skill of analyzing characterization in a very narrow context. Beers’ and Probst’s “fix” is to precede the text-specific comment with what they call “generalizable language,” language that reflects the general principle which will then be applied to the specific context. For example, a teacher might preface the previous comment with “When an author makes it a point to describe a character’s appearance or facial expression, he or she typically wants to indicate something about a character’s feelings. For example, notice how in this story…” The use of generalizable language, they seem to be arguing, makes it much more likely that students will able to transfer what they learn to another text. I think Beers and Probst are correct, and it is the very message we preach in UbD since those generalizations are what we call the Understandings that have to be identified upfront in planning. As indicated in the quotes from this post, it is also supported by the research on transfer: you have to be able to fully grasp the underlying principle to transfer knowledge. Otherwise it is too context bound and seemingly unique. UbD actually took shape in my mind more clearly through my teaching of English and my coaching of soccer. Same problem in each place: too little transfer; too little generalization; driven by unique texts/drills instead of a laser focus on the ‘game’. A pleasure to read… very helpful to me in attempting to design reading experiences for a couple of small groups of advanced 2nd grade students. Thanks again! Thanks! Let me know what you try!